More than any other, this song by Joe Bonamassa has been the soundtrack to 2016 for me. it’s a story of you and me. 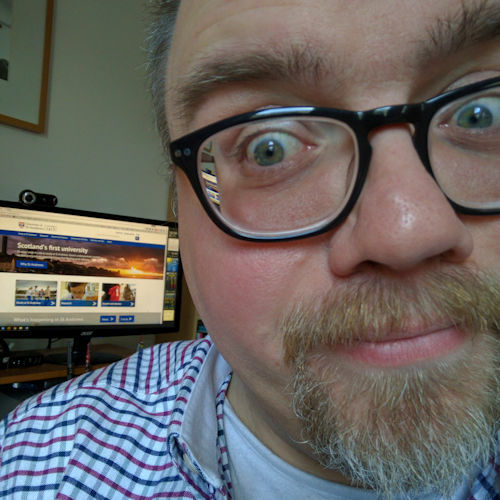 Back in February I learned that an old friend of mine from National Youth Choir of Great Britain, Alex Fleetwood, was raising money on Kickstarter to help develop a new board game with a twist: you need to play it with a tablet or smartphone. At that point the game was called Fabulous Beasts but following a trademark tussle with Warner Bros who claimed that the name was too close to their forthcoming film Fantastic Beasts and Where to Find Them, Alex and co. had to find a new name and eventually settled on Beasts of Balance, which I think I actually prefer plus it gives you a bit of an insight into the nature of the game. As the months rolled by and the Kickstarter updates flowed in from Sensible Object (Alex’s company) I began to grow increasingly more excited about the release of the game. When I received the email to say that my copy of the game had been dispatched I downloaded the Android app in anticipation. When it arrived, I wasn’t disappointed. Joshua and Isaac give the game a firm thumbs-up. 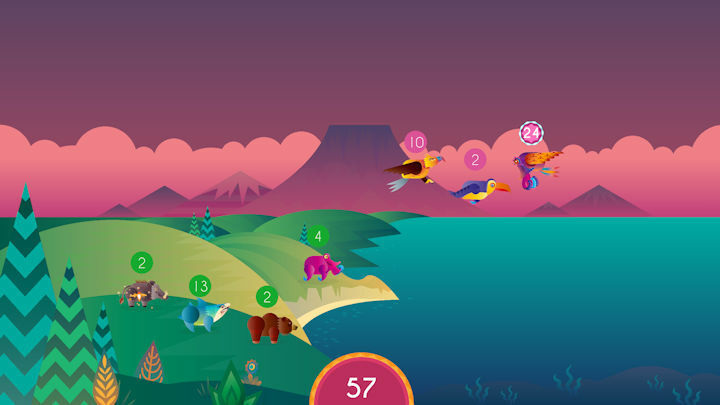 The game comprises an electronic sensing platform (the plinth) plus six beasts (bear, eagle, octopus, shark, toucan and warthog), two miracles (distraction and haste), ten elements (which offer various boosts), three cross and three migrate artefacts. I also ordered the optional beastly playmat (which is gorgeous) and the rather magnificent-sounding omnibeast. Setting up the game is as simple as switching on the plinth (a red light flashes steadily while it searches for the app), and then starting the app on your smartphone or tablet (Android and iOS are supported), assuming that you have already switched on bluetooth and made your device discoverable. You are presented with a new world which you then populate by balancing beasts on the plinth. Each artefact has an RF tag which you tap against the plinth to let the app know which one you are about to add to the game; and once you’ve selected it there is no changing your mind. Each artefact adds points to the game. Different beasts have different starting values, and the beasts all appear to be jealous of one another with the lower-scoring beasts each losing one point per turn until eventually becoming extinct. The omnibeast adds any one beast from your beastiary to the world, which adds a nice element of randomness to the game. Plus the artefact itself is massive and takes up most of the plinth which creates its own challenges. Behold my world! What fabulous beasts I have created. Pink elements boost sky creatures. Green elements boost land creatures. Blue elements boost sea creatures. Orange elements boost whichever beast is currently being visited by the firefly, who constantly buzzes between the various animals in your world. Most of the elements are half-and-half, so provide points for two groups of beasts. When a beast reaches 20 points they evolve into something new, and protect their scores. The app includes a beastiary that shows you all the beasts that you’ve collected. To prevent the individual animals’ lost scores impacting your overall score, you can play a miracle. Lost points are then caught in a cloud above the volcano. Our favourite is the snake-like distraction miracle which forces you to do something while placing the artefact on the plinth, such as holding the sun on the screen, or tapping the full moons as they arc across the sky. If you manage to complete the tasks you keep your points, they get trapped in the cloud; if you don’t the cloud turns red and with your saved points it disappears. The beautiful, celtic-knot haste miracle artefact sets time limits on your next move. Finally, there are six migrate (arrows) and cross artefacts, three of each. Tap the migrate artefact on the plinth and the beast that the firefly is currently encircling will move, for example from the sky to the sea. They will transform into another creature (toucan becomes tocean, for instance) and gain more points in the process; it’s quite a good way to save a beast from final extinction. Similarly, the cross artefact will create a new beast from the one that firefly is visiting with one other in the world. The new beasts have spectacular names, many of which are puntastic. If you knock things off the plinth you trigger the volcano, and you have seven seconds to rebuild your world before the volcano erupts and destroys everything. I’ve now played this with three groups of people of different ages groups, and every group has loved it. Sensible Object have found the perfect balance (pun intended) of real life, tangible game and computer game. 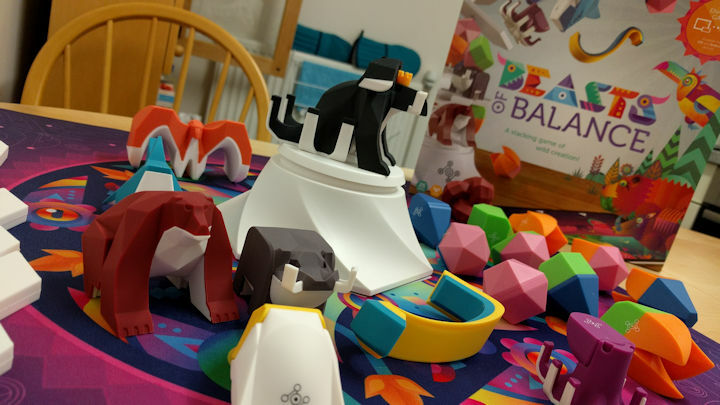 On its own, as an object-balancing game it would be fun in itself, and my children and I have spent probably too much time simply trying to find different ways to balance the artefacts on the plinth and off. It’s a bit like Jenga in that respect. It requires concentration and a steady hand. But more than that it requires the group to work together – players don’t compete against one another, they are collaborating to collectively try to gain the highest score. And that makes a tremendous difference to the nature of the game and the atmosphere in the room. 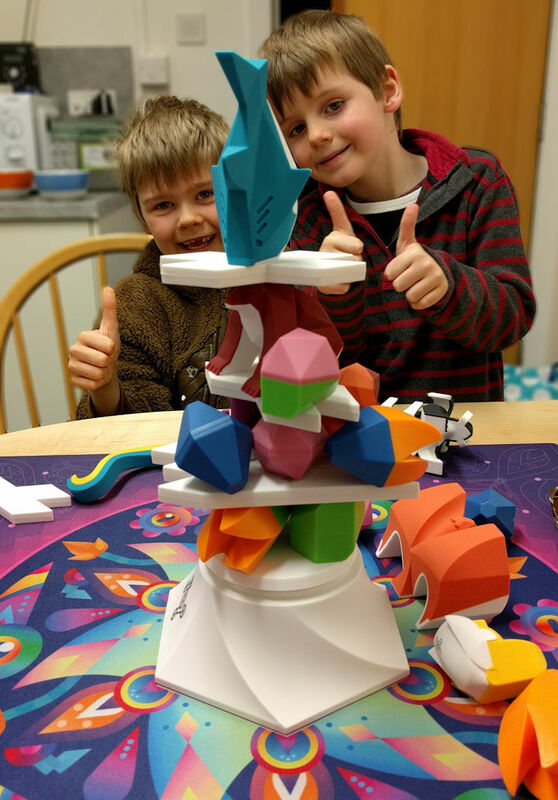 We have a rule that whoever knocks over the stack and brings the current game to an end is the person to place the first artefact in the next game. It purposefully shifts the idea of being punished or blamed. The addition of the virtual world is what takes this game to another level. That what you do on the real world plinth affects what happens in the game is remarkable enough, but that your beasts evolve into different beasts, and you have to think collaboratively and carefully about your next move to try to keep everyone alive is where the real fun comes in. We have yet to have a game where we have a) kept all the beasts alive, and b) used all the artefacts. We’ve been close on a couple of occasions but it’s one of the things that drives the “okay, just one more game…” excuse to keep on playing. What else drives us to keep playing is the collector instinct that drove so many of our Victorian ancestors to explore the natural world and return with specimens of fabulous beasts and insects. A recent update to the app means that you can now explore the beastiary without needing to be connected to the plinth. And then there is the obvious drive to try to beat the highest score. Ours is currently 146, but Beasts of Balance tweeted on Christmas eve that someone had reached a magnificent 866 points. This game has exceeded my expectations. I thought that it would be fun but I didn’t expect it to be quite so immersive. On most occasions I’ve played until the battery has drained on my Google Nexus 6P – I guess you have to set a time-limit somehow. That this has been a hit with people aged between 5 and nearly 50 is a plus. The older people may have a slight advantage in terms of strategy, but the younger player are often a little less shaky! And so we did… until I had to recharge my phone. I’m excited to see where the game goes next. I already want to buy the Lalnalion beast (and am kicking myself that I didn’t when I pledged on Kickstarter). I’d love to get my hands on the RF sticker pack too and start adding our own random bits and pieces to the game. And it would be interesting to introduce malicious beasts into the world or a game mode that tells you which artefact to play next. I asked my children what they liked about the game. Reuben and Joshua (twins, 8) in their usual understated way just said that it was “great” and “good”. Isaac (5) , however, said “It’s amazing… awesome… epic! I like the omnibeast because he has a crown.” You can’t argue with that, really. Good work Alex, George and team! We love your game. You can buy Beasts of Balance for £69 GBP from beastsofbalance.com. The link above gives you £5 off any purchase over £30. A belated merry Christmas to one and all. 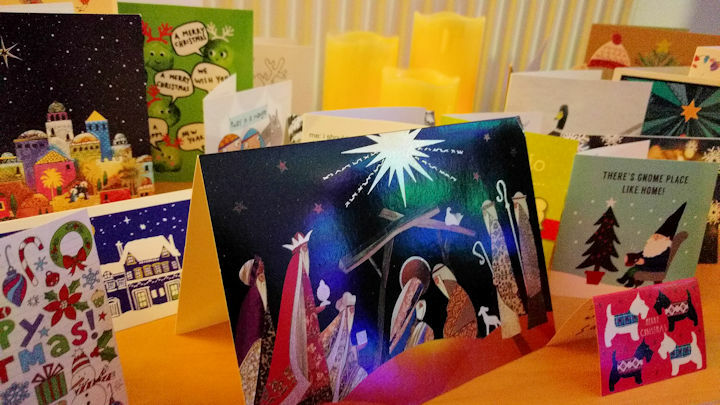 I know that for many Christmas is a difficult time, an isolating time, so I hope you’ve had a great celebration and an opportunity to be with the ones you’ve wanted to spend it with. It’s been a very quiet Christmas for me this year. I had Reuben, Joshua and Isaac here on Friday and Saturday (Christmas eve), watched them open their presents on Christmas morning (at a respectable time after 7:30am), before they had to travel to Argyll to spend Christmas day with their cousins. After that I retired to bed with a stomach bug and slept for about two days, which was just what the doctor ordered after this past semester in hall. This is the first Christmas day that I’ve ever spent entirely on my own. After the busy-ness of 2016, moving to St Andrews in January and then hitting the ground running in terms of wardennial work, not really getting much of a break during the summer, and then being thrown into a new semester with a new (and amazing) wardennial team I have really appreciated the space and solitude. Besides sleeping, I’ve done very little. I restrung my acoustic guitar (D’Addario EJ15 Extra light .010 to .047) and have been playing guitar over the last couple of days than I have in months. It has been cathartic and soothing. I miss playing guitar live. I’ve listened to lots of music. Jane and the boys gave me Queen at the BBC on CD for Christmas, plus quite a bit of Lamb of God and Exodus. 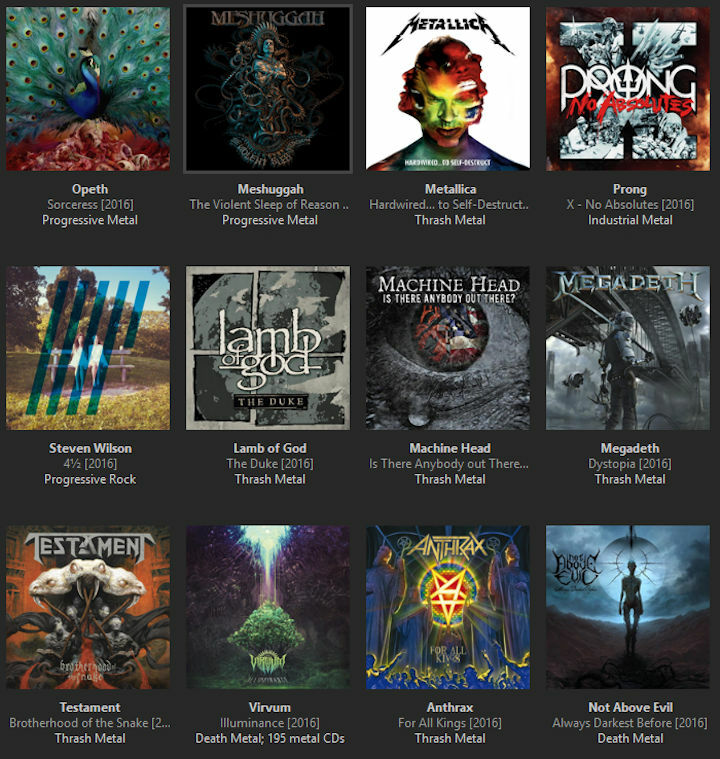 Good, soothing Christmas-y thrash. JJ Hrubovcak’s Death Metal Christmas (2013) got an airing on Christmas day, of course. I finished watching The IT Crowd box set (series one to four), and have begun watching Blackadder Remastered The Ultimate Edition box set, which I actually got last Christmas. I’ve played a little Call of Duty: Ghosts, which is my favourite edition of the franchise. And I moved this blog to become my main site now. I’m trying to simplify my web presence. Actually, that’s quite a lot, isn’t it. It hasn’t felt like that. It’s felt quite relaxed and quiet. Having just got used to the quietness, the boys return tomorrow, and on Friday I’ll likely head down to Selkirk to see my folks. Then it’ll be time to return to work. This afternoon I moved my blog from the subdomain blog.garethjmsaunders.co.uk to become my main website here at www.garethjmsaunders.co.uk. 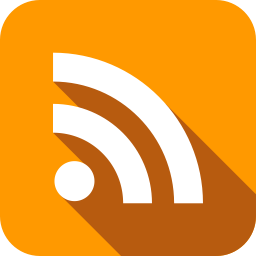 If you are subscribing to my blog then please update the RSS feed to https://www.garethjmsaunders.co.uk/feed/. In the meantime, I’ve got a redirect in place to forward all traffic to the new location. It’s something that I’ve wanted to do for a while as my main website wasn’t really offering anything more than I already had on my blog. I also wanted to simplify things significantly ahead of another web host move.